Every year, lots of people are choosing Texas primarily for the cheaper cost of assisted living and low taxes. Additionally, you can buy a bigger house for less money in Texas, when compared to some less affordable states like California. The cost of assisted living in Texas is almost 10% cheaper than in other states in the nation. Cheap housing isn’t the only thing that’s alluring to people moving to The Lone Star State as this state has excellent healthcare, fresh groceries, and utilities that are also cheaper than some more expensive states. Seniors that choose to retire in this state will enjoy living in bigger houses while using the saved money for travel, recreation, or their grandkids. will be waiting for them as well. The climate in Texas is rather moderate throughout most of the year. The colder months have an average temperature of 43.6 degrees Fahrenheit, while warmer months have an average temperature of about 95 degrees Fahrenheit. This type of climate lets people to enjoy the outdoors more frequently and participate in many recreational activities. There’s lots of information to take in regarding The Lone Star State’s senior facilities, benefits, and assisted living costs. If you’re still interested about moving to Texas, we have prepared some crucial information about the various senior living options, including the support systems that have been put in place, as well as the amenities that each of these types of senior living has to offer. If you have a general idea about which city you’d like to move to, feel free to use the list of cities below. With a housing index of 90.40, Texas is considered to be more affordable place to retire to when compared to the other states in then U.S. One-bedroom apartments in Texas have an average monthly cost of $723, compared to the national average of $825 per month. Two-bedroom apartments have an average monthly cost of $903, compared to the national average of $1,027. The cities that seniors most often choose to retire to are Richardson and Abilene. Richardson is within a somewhat close proximity to Dallas and Downtown, which makes it easy for people to get around. Abilene is a city of average size with many restaurants and stores that are easily accessible. You must be curious about the monthly costs of senior living in Texas as well, so let’s read on. Seniors that choose to live in their own homes might still need assistance with a certain level of home healthcare services, determined by their medical condition. These services include help with housekeeping, daily chores, meal preparation, and more. Home healthcare services in Texas go for an average monthly cost of $3,718. Seniors that don’t have caregivers but would prefer staying at home have the option of hiring home health aides which provide more extensive personal care. Home health aides in Texas have an average monthly cost of $3,813. The state also has adult daycare centers which provide seniors with a supervised facility to stay at during the day while their primary caregivers are occupied with their personal responsibilities. This type of senior care has an average monthly cost of $758 which is a pretty low when compared to lots of other states. Do keep in mind that adult daycare doesn’t include extensive nursing care, making it a perfect option for seniors that are still active and healthy but still in need of social activities so as to keep themselves busy, including some therapeutic and health services. Texas is also a home to many assisted living facilities scattered throughout the state, providing seniors assistance with day-to-day activities. This type of senior care has an average monthly cost of $3,500 and provides health services and personal care while staying at an assisted living facility. Keep in mind that this is not to be considered an alternative to nursing home care – it’s basically an intermediate form of long-term care. Seniors that can no longer stay alone at home and don’t have caregivers that can take care of them during their final years should take a look at some of the many nursing homes in Texas. Apart from housing, nursing homes also provide seniors with 24/7 supervision and nursing care, including medications, therapy and rehabilitation – where needed. Semi-private rooms have an average monthly cost of about $4,563, while private rooms go for an average cost of about $6,053 per month. When put in comparison with the national average, Texas has more affordable prices for nursing home care. When you’re making a decision as big as retiring to another state, it’s a good idea to familiarize yourself with the benefits that await you there. If you want to find out more about the benefits of choosing Texas for retirement, keep reading below. Since most seniors prefer living in places with warmer temperatures that are similar to those that can be found in, let’s say, California, but want to save some money on costs, Texas is good option to consider. A bigger part of Texas’ landscape has mild winters, in addition to varied geography with climate and scenery for everyone. These include the pine woods of East Texas and the rolling plains of the Panhandle, to name a couple. Being as big as it is, Texas has lots to offer to seniors wanting to dive into exploration. The state is full of coastal towns, high plains, and gorgeous natural scenery. Some of these exploration venues include the Palo Duro Canyon, Padre Island National Seashore, Natural Bridge Caverns, and the Big Bend National Park. Apart from these exploration areas, Texans can go shopping or eating at the livelier areas like San Antonio Riverwalk and downtown Austin. Rodeos, world-famous barbeques, and music concerts are also plentiful in this state. Texas is considered to be a very tax-friendly state because it doesn’t have income tax, meaning that seniors won’t have to pay taxes for their Social Security benefits. This state is one of the seven states that doesn’t have any income tax from individuals, no interest income, as well as no taxes on dividend income. The regular sales tax rate is 6.25%, a percentage that varies depending on the counties, cities, or special districts that can be found in the state. There are also no estate or inheritance taxes in Texas! While it’s more expensive to move in places like Dallas or Houston, most of the areas in Texas have a pretty low-cost of living, something that is self-evident when compared to the national average. Housing is cheaper as well, including utilities, groceries, transport, and similar. The more affordable places to live in Texas are San Antonio, McAllen, and San Marcos, to name a few. While Sherman and Tyler aren’t as affordable, they aren’t that expensive either. Texas has plentiful senior living options to choose from. Determined by each individual’s medical condition and personal needs and preferences, seniors can choose from independent living, assisted living, memory care, or nursing homecare. Read below to find out more about the costs and amenities that are associated with each of these. Seniors that still lead a somewhat independent and healthy life, without the need of 24/7 nursing care can choose independent living. This senior living options gives them more privacy within the surroundings of their homes. Texas has over 730 independent living facilities to choose from, with an average monthly cost range from $453 to $4,732. The more expensive ones are located in the Midland metropolitan area, while the more affordable ones can be found in the Laredo Area. The most common form of independent living is apartment living. Seniors can stay at one of the apartment senior communities for people aged 55+ or 65+ which means that they will live with their peers. In addition, active senior communities offer various services like transport, and amenities that include but are not limited to, gyms, walking and hiking trails, pools and jacuzzies, as well as dog parks where seniors can take their pet out for a walk. Seniors that have the money to spare can choose to buy their own home from one of the many options which include family homes, condos, townhomes, or mobile homes in one of these senior communities. The Texas home value index is $174,300 and is considered to be extremely affordable when compared to other states like California or Hawaii, which have a home value index of $524,000 and $620,400, respectfully. Texas has over 1,500 assisted living facilities operating throughout the state, providing seniors with access to social and local activities, as well as quality healthcare. The professional and experienced caregivers that are employed at these facilities help their residents with housekeeping, transport, laundry services, and meal preparation, to name a few. Assisted living communities also have ‘round the clock surveillance that ensures seniors’ safety. The average monthly cost range for assisted living facilities in Texas can get as low as $825 and as high as $8,605, a price that is mainly determined by the location of the facility, as well as the level of care needed. Metropolitan areas have a higher cost, while suburban towns have more affordable costs. Over 1,100 memory care centers operate in Texas, providing special care and attention for seniors suffering from Alzheimer’s and other dementia-related ailments. The experienced staff at these centers provides seniors assistance with daily chores, personal care, and medications. They also go through training to help seniors get calmed down when they get upset by the emotional pain brought on by dementia. 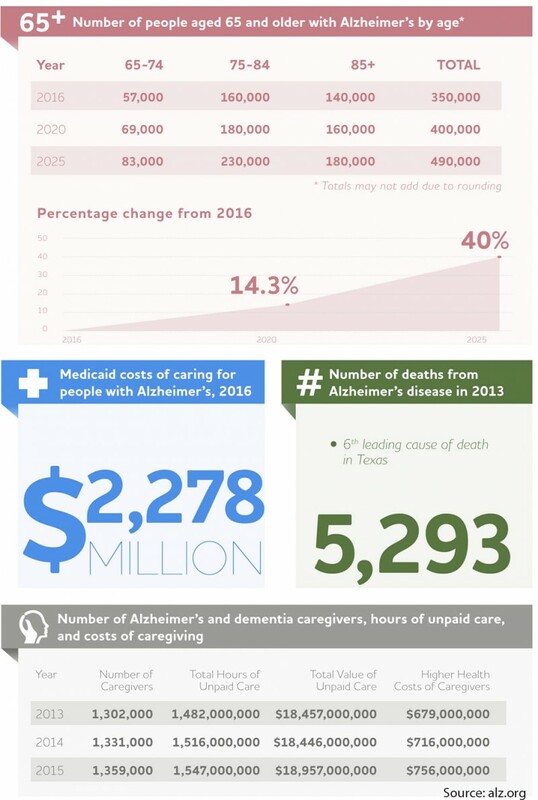 The average annual cost for memory care centers in Texas is $61,291. The most expensive centers can be found in Midland, for the average annual cost of $90,090, while Laredo is home to the more affordable options at an average annual cost of #35,640. Memory care centers are the first and best option for seniors suffering from dementia, and another benefit to these centers is that they are mostly covered by all insurances, except Medicare, which doesn’t cover the costs for long term skilled nursing care. While Texas’s senior population is the third highest in the country, it’s also one of the youngest states as well. This is a good thing for seniors, because the state has a large working age population that fills the state funds by paying taxes, which, in turn, can be used for better senior care. Lots of other states can’t do this because their population is gradually getting older, without a working age population to fill in the gaps. Because of these, and many other reasons, seniors that choose to retire in Texas can be sure that they will receive quality care at one of these 5,000+ senior living providers found all over the state, which include adult daycare, hospice care, and respite care. Over 100 adult daycare facilities operate in Texas and they provide families with help over taking care of their seniors. This type of senior care gives seniors access to a place to stay during the day, as well as providing meals or assistance with their daily chores. This senior living option is perfect for families that have busy schedules during the day and are unable to provide them with the care that is needed. The social aspect is another benefit that this type of care. Seniors will never feel lonely because these facilities have group activities that foster friendship with their peers and provide physical therapy as well, like dancing, or trivia nights and puzzles so as to keep their minds active. The average annual cost for adult daycare in Texas is $8,970, which is more affordable than states. Keep in mind that this is the state average cost because areas exist with even lower adult daycare costs, like the McAllen and Edinburg areas which have an average annual adult daycare cost of $6,240. The places with least affordable adult daycare facilities can be found in Wichita Falls, for an annual average cost of $32,500. Seniors that have been diagnosed with terminal illness are advised to take a look at hospice care centers. It is a common practice for families to admit their elders in one of these facilities just a few days before they pass on, without knowing that hospice care can be provided for up to 6 months, if a doctor thinks that the patient will pass on by then. Even if this is not the case, and the senior keeps on living past these 6 months, a doctor can review the condition and make a recommendation for the senior to keep on receiving hospice care. If a senior is deemed eligible for hospice care, it is wise to use the benefit of hospice care at the earliest convenience. This type of care takes a personalized approach to each patient, treating them with medication for their physical pain, and also providing grief counseling for both the family and the senior to make an easier transition before passing on. Hospice care also offers chaplain services for spiritual needs. All of these methods of treating seniors help them and their families come to term with the approaching death and provide peace and acceptance for both. Most of the time, hospice care is fully covered by the Medicare Hospice Benefit, meaning that seniors and their families will not feel the full brunt of most of the costs, if not all. Seniors on Medicaid are also eligible for the Medicaid Hospice Benefit, which is available in Texas. As there are almost no direct costs for seniors and their families, hospice care should not be set aside since it will surely increase the lives of everyone involved. Texan families have strong family ties, and several generations can end up living in the same house, or in close proximity. This provides the option for seniors to receive the much-needed care in their own homes, but often at the emotional cost on their children, spouses, or grandchildren. Respite care alleviate this by providing a professionally trained caretaker on a temporary basis, giving the primary caregiver a much-needed break so they can take care of their daily responsibilities knowing that their loved one is in the hands of a professional. Caregiver burnout is a real thing, and primary caregivers shouldn’t take it lightly as it can lead to severe exhaustion, both mentally and physically. Thanks to the aforementioned large working age population in Texas, the cost of respite care in this state is much lower than in the other states where the working age population isn’t as high as here. The average annual cost of respite care in Texas is about $50,735 which is almost half the national average. Owing to the flexibility of respite care, it can be provided on daily, weekly, or indefinite basis, depending on the senior and primary caregiver’s needs. Because of this, the monthly costs can vary greatly, ranging anywhere from $4,089 to $11,310 per month. 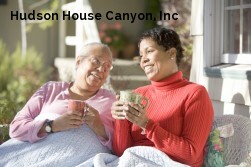 Assisted-living-facilities.net will help you to find the best quality Assisted Living facilities in Texas. You can also find skilled nursing, memory care facilities, retirement communities and assisted living regulations in Texas. Here you can compare ratings and check prices and costs for assisted living. Read reviews and more, with the best directory for Assisted Living Facilities. The state of Texas has 3185 assisted living facilities. If you're searching for information about assisted living communities in Texas, you need to look no further! Assisted-living-facilities.net will provide you with the most comprehensive information about the number of 3185 assisted living facilities for seniors that are currently available in Texas. The assisted living services available in Texas include in-home residential and assisted living situations, nursing homes, retirement communities, adult day care, and a range of independent living situations, you can also find Alzheimer's and hospice care. Searching in Assisted-living-facilities.net to find information about Texas's assisted living communities is simple! You can use the site in these ways to search and find the assisted living facility or community that is the right one for your needs, and allows you or to your loved one, to live close to friends and family and to enjoy fully. Getting all the support of the amenities that Texas has to offer. The average monthly starting costs for assisted living facilities in Texas (higher for residents requiring memory care) starts and depends on the level of care the resident. The average monthly cost of assisted living in Texas starts from $1,600 to $4,400.